So some promotional materials for the Swingline Stack and Shred just crossed my desk and I'm fairly impressed. If you are like most people, you fall behind on your paper work every once in a while and have been subjected to the horror of shredding a pile of papers in chunks of 8 pages at a time. If that's the case, the Stack and Shred is meant for you. Basically, you just throw a pile of papers in the top, you close it and go about your life while it magically shreds the paper. Okay, so it isn't real magic like Harry Potter, but you close the lid and things happen, so it's like engineering magic and that's good enough for most people. Swingline created a promotional website (StackAndShred.com) for the Stack and Shred that features a guy shredding paper in small chunks and the same guy using the Stack and Shred. The website isn't very exciting, and with the addition of some boring repetitive elevator music, it makes shredding seem as exciting as watching paint dry or watching grass grow. So, commentary aside, the shredder is rated at 60 dB so it is as quiet as any of Swingline's quietest shredders. The specs say the bin can hold 200 shredded sheets so that means you'll only be able to run a full auto feeder twice before you need to empty the bin. So 100 sheets of paper that feed at 7 fpm (feet per minute) means that it will shred approximately 7 sheets of 8 1/2 x 11 standard office paper in one minute. 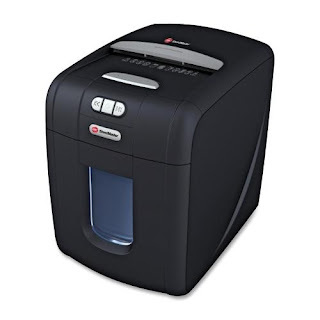 So, in just a little over 14 minutes you could successfully shred 100 pages of junk mail or confidential paper work. Depending on the paper you attempt to shred, it may or may not shred more than one piece at a time, so it will hopefully finish much faster. Unfortunately, and there is always an unfortunately, according to the shredder spec sheet, it runs on a 10/30 run-time/cool-down schedule, so if your shredding takes longer than 10 minutes, you will have to wait 30 minutes to resume shredding. I got to take a look at one of the shredders in person and it is formidable. The feeder grabs your paper from the middle using some high friction rollers and pulls it into the shredder, so any pieces that won't fold will potentially cause a problem. However, the centralized feeder does mean that almost all paper and paper sizes can shred as long as they make contact with the rollers. 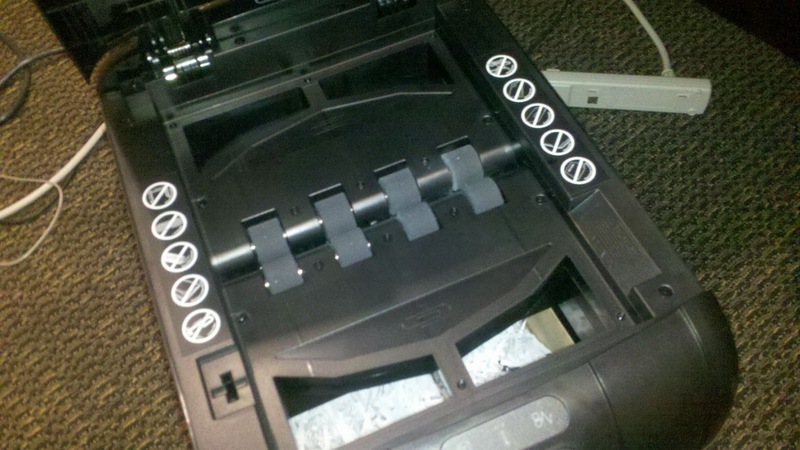 In practice I found that the shredder was quiet, but I think "Super Quiet" is probably a slight exaggeration. I didn't have a decibel meter on hand, so I'll assume the 60 dB is correct. If you regularly need to shred large stacks of paper, but don't want the hassle of finding and paying a professional shredding company you should at least give the Swingline Stack and Shred a look. Manufacturer redesigns, for example, inside overhauls, new tires and so on all expansion the estimation of an auto.